It’s time for one of my favorite posts of the month. I love The Secret Recipe Club because I have discovered so many fabulous blogs from the link ups four Mondays a month.This month I was assigned Meet the Swans which is one of the original blogs. This is a new to me blog so as soon as I received the email I dived right into the recipe archives. Krista has an amazing selection of desserts and this German Brownie Torte, the Chocolate Peanut Butter Bars, and these Rain Doughnuts were calling my name. 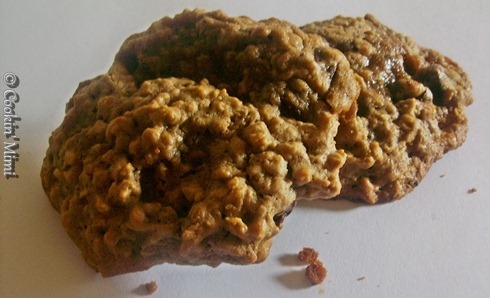 Since I seem to have a slight thing for chocolate and peanut butter, peanut butter and oatmeal and chocolate, peanut butter, and oatmeal I decided these Choco-Oat Peanut Butter Cookies would be perfect to make. I made a couple of small changes to the recipe. The original called for a homemade fudge sauce and I used plain old chocolate syrup because I had that on hand. I also chilled the dough for a couple of hours before baking to the let the butter harden to minimize cookie spread. Cream together the butter and sugars in a mixing bowl until fluffy. Add the egg and vanilla and beat until creamy. Beat in the chocolate syrup and peanut butter until well mixed. In another bowl mix together the flour, baking soda, salt and oats. Add to the chocolate/peanut butter mixture and stir to combine. Stir in the chocolate chips. Cover with plastic wrap or place in a lidded bowl and chill for 1-2 hours. Bake spoonfuls of dough on lightly greased cookie sheets in a preheated 350 degree oven for 10-12 minutes. Cool on sheet 2-3 minutes then finish cooling on racks. These have become one of my favorite cookies and I will be making them time and time again. It must have been hard picking just one thing! These look amazing-nice job. There is definitely a PB-Chocolate theme going around this month, LOL!! Great job! 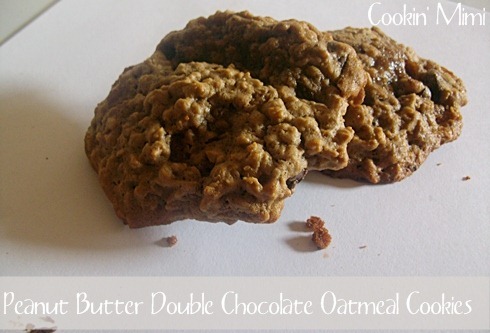 Gotta love a good cookie recipe, especially with chocolate and oatmeal! I love a good oatmeal cookie. Add some chocolate and peanut butter, and you can’t go wrong! These look great. Pinning htis recipe now. Mmmmmm. I love peanut butter oatmeal cookies so much. Adding chocolate would be the icing on the cake, so to speak. I love the sound of these cookies, I’m bookmarking the recipe.